Our employees have a diverse educational background and a broad range of experience. Many have an aviation related education with extensive work experience in tourism and aviation, whilst other members of our team have degrees and experience within business, engineering, psychology, literature, nursing and law to name a few. We try to identify positive, service oriented and capable people to join our team. 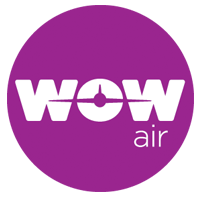 In a fast-growing company like WOW air it is important that our employees be flexible and willing to help with the continued growth and success of the companyMost importantly we believe in the importance of enjoying the work at hand, both at the office and when servicing our guests. WOW air is a happy and fast growing airline, where employees have ample opportunity to grow and influence their work environment. We encourage our staff to let their voices be heard and make their mark on WOW air operations. The atmosphere is good, job satisfaction measures high and we always have fun at work. We put great emphasis on employee satisfaction and encourage healthy living and good work conditions. WOW air offers competitive wages and equality prevails within the company. We are concerned about the environment and its protection and therefore waste is sorted and kept to minimum. Furthermore our fleet consists of new aircraft that pollute less than older machines.